Color Country Aussies excels at producing Miniature and Toy Australian Shepherds which possess the temperament, intellect, and drive of their larger Standard counterparts. We have a passion for what this breed exemplifies and constantly strive to magnify and maintain their most cherished qualities. Australian Shepherds are known for their great intellect, loyalty, compassion, and spirit. We invite you to take a look at our beautiful pups and hope that you find one to join your home. We are passionate about our dogs and want to be sure they are going to be loved and well cared for throughout their lives. To help make sure our puppies go to such homes, we have a NO REFUND policy — once a deposit or purchase is made we DO NOT offer refunds if you change your mind, for whatever reason! We also ask that you sign a contract when buying a puppy from us. Please read the contract below. You will soon be able to sign the form online, but until then we will email the form to you once you pay your deposit or purchase. 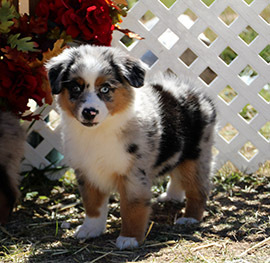 Color Country Aussies excels at producing Miniature and Toy Australian Shepherds which possess the temperament, intellect, and drive of their larger Standard counterparts. We have a passion for what this breed exemplifies and constantly strive to magnify and maintain their most cherished qualities. Australian Shepherds are known for their great intellect, loyalty, compassion, and spirit. For the last 15 years, we have been breeding and working with Australian Shepherds to become the epitome of perfection. 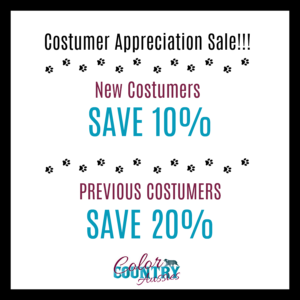 We have been showing our dogs for 10 years and have received recognition and great acclaim for their abilities and beauty. In fact, many of our faithful canines have been awarded with championship titles and other prestigious awards. Here at Color Country Aussies we specialize in herding/working dogs. We will be introducing your future puppy to ducks and/or goats to have them started for you. Don’t let our dogs’ distinctive pedigrees let you think they have strayed from their background as talented farm workers. In our rural area, we are surrounded by red cliffs and the heritage and traditions of the American Cowboy. At our small ranch in Southern Utah, our dogs have daily interactions with the many farm animals we raise. We own large dogs, cats, goats, calves, and horses which our lil’ Aussies have spent their lives becoming acquainted with. My children are extremely active in rodeo and the training of our horses. My family values the importance of working as a team with the animal, treating your loyal partner with respect, and using hard work and patience to achieve your goals. Our dogs have been put in many typically uneasy situations, such as small children, loud noises, and various animal interactions, all of which they have passed with flying colors. Color Country Aussies are ready and eager for any situation, including loving every member of your family. As a stay-at-home mother, I know the importance of raising my dogs around all different ages and situations to ensure the friendliest atmosphere in the home. My three darling children, including my 11-year-old daughter Taylor, are very involve in the developing of these dogs into wonderful companions. With Taylor’s help, I have the great opportunity to spend all day with our little fur babies and raise them with and as my own children. Each puppy will be used to small animals as we use them all on the ranch to help us with the livestock. It is always fun to watch the momma dog teach her fur babies what her job is on our farm. Not only are these dog’s crucial to our farm life, they are crucial in our daily lives. I have spent many sleepless nights assisting each momma dog in birth and providing a safe and nurturing environment for her new puppies, and countless days teaching and training our dogs to be at the top of the breed in herding/working dogs with good sound temperaments. While our area is known for cold winters, we keep each puppy dry and warm with heaters and a protective indoor area for them to play. These dogs are given the utmost attention and care as we keep them physically safe and healthy. We have a wonderful vet who is an expert in the care and needs of the breed. He ensures each dog is in wonderful health and is given the best food and vitamins. It is through this personal relationship with our veterinarian that we know that our Miniature and Toy Aussies are receiving the best care available. While this breed is amazing at companionship, they also excel in service, obedience, therapy, herding, outdoor recreation, conformation, tracking, and showing due to their incredible smarts. We constantly have puppies and adults which are being trained to succeed in agility, conformation, therapy, and especially in working dog skills. If you are looking for a dog that is easy to train, and sometimes too smart for its own good, look no further. As you consider the eyes of an Aussie it is easy to see the intelligence and understanding which this breed is famous for possessing. At Color Country Aussies, we value friendliness, respect, and timely response to every potential buyer. Just like the breed we sell, we take pride in the service we can give to you. Because of this, we wish to go above and beyond by selling our puppies with current and age appropriate vaccinations, healthy and healed docking, and dew claw removal and a full health veterinarian check before going to their future home. I will have all dog or puppy information on my website. If paying with PayPal, you agree to this contract with the puppy you are buying whether you sign this or not. Your dog/puppy information will be on the invoice thru PayPal. of_____________, leaving a balance of $_____________to be paid before the dog ships or is picked up by the buyer. Color Country Aussies specializes in herding/working Dogs. Please note, any deposit or money sent is nonrefundable and nontransferable for any reason. To the best of my knowledge, said puppy/dog is in healthy and sound condition at the time of sale. Buyer has 48 hours from the time of delivery/pickup to have a vet check done on said puppy. Vet check must be done by a licensed veterinarian. Buyer is required to have a licensed veterinarian administer two more puppy vaccines to said puppy, parvo and distemper vaccines must be given at two-four week intervals following first vaccines given by breeder. If buyer fails to have vet check done within 48 hours or fails to continue vaccines as stated above, the parties agree that any guarantee will be considered null and void. Keep shot records from your vet. Along with the vaccinations being kept up, we require that your puppy be fed Life’s Abundance dog food and give the supplements, and my health guarantee will be extended for two years. There cannot be any lapse at any time or my extended health guarantee is void. This will be from the time the puppy leaves Color Country Aussies. Our Health Guarantee does not include any parasite, internal or external, as this is a treatable condition. Only genetic disease or defects will be considered. Each case will be dealt with individually. Color Country Aussies does not guarantee size of our puppies. We will try and give you our best guess but sometimes puppies grow larger than we expect and sometimes they do not grow to what we expect. These are live animals and as with any live animal or person it is hard to know for sure. Hip dysplasia, should be found before the age of 12 months. Inherited eye defects will be covered until the age of 12 months. 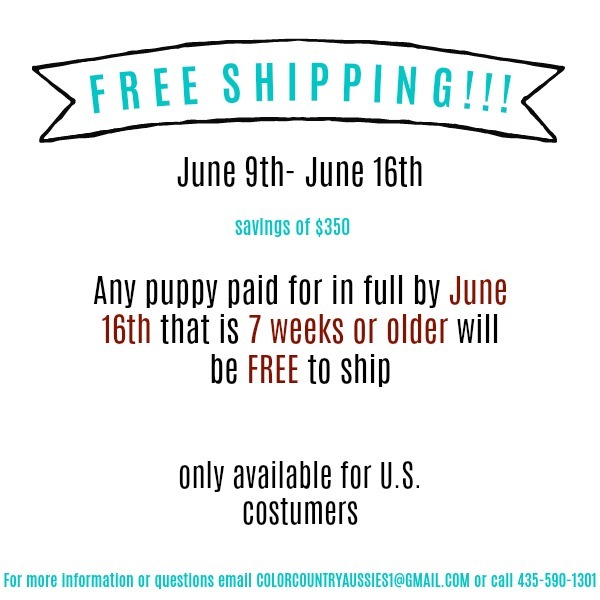 The Buyer agrees that they are responsible for all shipping and transportation costs, if applicable, to be remitted to the Breeder prior to the shipping of the dog. Personal checks will not be accepted. Please pay by PayPal, cashier’s check, or money order. The remaining balance must be paid before puppy is picked up or shipped. It is agreed between Seller and Buyer that this dog is being acquired as a livestock working dog to be used for tasks appropriate to its breed. These tasks include primarily herding, other uses include, search and rescue, therapy, obedience, Frisbee, fly-ball, tracking, agility competition. The dog is not being purchased for resale nor will it be used or trained for activities which are illegal or for which it is not suited because of temperament or conformation. Specifically, it will not be used as a guard or attack dog, to hunt or fight other animals, or used in scientific experimental research. *****Return the puppy or dog in its original condition and receive a replacement of equal quality at the Seller’s discretion from the next available litter. Registration paper (with signed transfer back to Breeder) must accompany the dog. Buyer must provide veterinarian records showing the dog is up to date on all vaccinations and must be heartworm free (heartworm test within the past ten (10) days from a licensed veterinarian). The Buyer agrees that all shipping and transportation costs of the replacement pup are their responsibility and no puppy/dog will be shipped without these costs being remitted to the shipper (airline or ground transporter) or to the Breeder first. The Breeder will use her best judgment in evaluating the working or pet quality status of the represented dog. Due to the numerous circumstances involved, and since the Breeder cannot guarantee how the Buyer will handle, raise, manage, maintain a puppy/dog, the Breeder will not guarantee that a “Trial or Herding Prospect” dog or puppy will be successful in the trial ring or herding livestock as an adult and no warranties are made to that effect. The Breeder encourages the Buyer to seek and participate in training or clinics for herding dogs on livestock or trial clinics to assist and mentor Buyers in preparing and exhibiting dogs which are evaluated to be of trial quality. If the dog does not show any desire to herd livestock by the time he/she is 24 months old, and providing the dog has not been abused, neglected, and has been given the chance to herd livestock, the Buyer may return the dog to the Breeder and after evaluation by the Breeder if it is then determined that the dog has no desire to herd livestock, then the Breeder (when there is a suitable dog or puppy available) will offer that dog or puppy to the Buyer. There will be no refund of the purchase price at any time. Registration paper (with signed transfer back to Breeder) must accompany the dog that is being returned. Buyer must provide veterinarian records showing the dog is up to date on all vaccinations and must be heartworm free (heartworm test within the past ten (10) days from a licensed veterinarian). 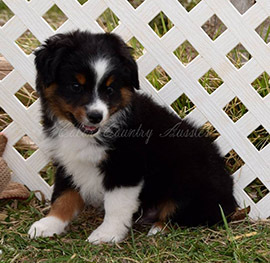 The Breeder strongly encourages the Buyer to have the puppy/dog seen by a licensed veterinarian, of the Buyer’s choice, within 48 hours of picking up the dog. When available, a comparable puppy will be exchanged. The buyer assumes all responsibility for any veterinarian bills. The Breeder cannot be held responsible for something that is out of their control, as with placing the care and control of the puppy/dog with an airline or ground shipper. The Buyer understands that once the puppy/dog has been delivered to the departing airport or ground hauler, the Breeder is no longer responsible for its safety, health, or well-being. The Buyer understands that it is the Buyer’s choice to have the puppy/dog shipped and that he/she is solely responsible for any problems incurred during shipping or after because of shipping. The Breeder strongly encourages the Buyer to check the puppy/dog at the airport. If any injuries or health problems are noted, contact the proper airline or ground transportation authority for concerns immediately. The Breeder strongly encourages the Buyer to have the dog seen by a veterinarian, of the Buyer’s choice, within 24 hours of picking up the dog from the airport or ground transportation. The buyer assumes all responsibility for any veterinarian bills. These dogs will be picked up in person. NO SHIPPING. If the dog has been bred under any circumstances, the guarantee will be considered fulfilled and the Breeder will be held to no further obligations to the Buyer and the dog will not be registered, nor any of the puppies be eligible for registration. All Working Aussies will be registered with the American Stock Dog Registry ASDR. The owner of the dam at the time of whelping is responsible for naming the puppies and registering the litter. The Breeder reserves the right to affix the kennel name(s) before a registry name for the dog. No other kennel name shall be affixed to this dog’s registry name. If the dog is purchased as a companion (pet only) or for any other use other than a primary livestock working dog, registration papers will only be given after proof of neutering/spaying has been provided by the Buyer. Any Puppy being sold as a pet CONNOT be shipped it must be picked up in person. The Buyer agrees to maintain the dog in a humane environment and properly train and care for the dog. Specifically, the dog will be legally licensed and inoculated against rabies, distemper, parvo-virus, and other communicable diseases as recommended by a qualified licensed veterinarian. The Buyer agrees to maintain the dog on a commercial heartworm preventative on a schedule recommended for the specific region in which the dog will reside. Herding bred dogs can be sensitive to Ivermectin products, such as Ivermectin (labeled for livestock), Heart Guard, Revolution, and Proheart6, which can sometimes cause fatal results. 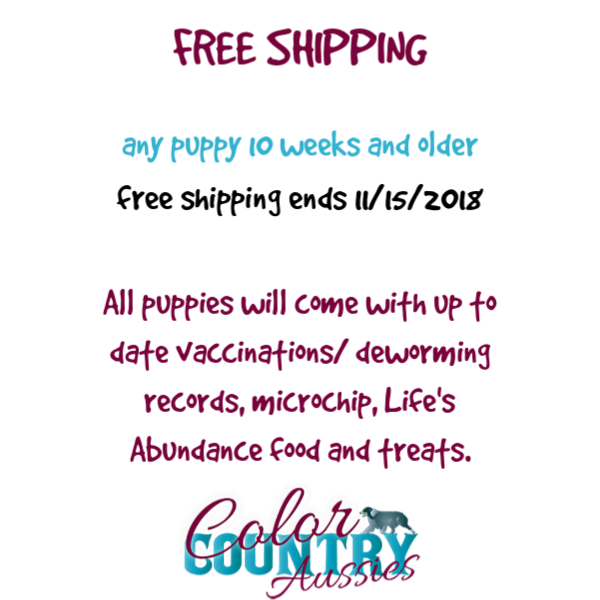 The Breeder strongly suggests to not use these products under any circumstances either by liquid, orally, or injection as a means of heartworm preventative. The Breeder suggests the use of Interceptor as a means of heartworm prevention. The Buyer agrees that the dog will not be allowed to roam on neighboring properties and will be confined in a secure fenced area when unattended. The Buyer agrees that he/she is not acting as an agent of, nor will the Buyer in turn sell, consign, give away, or place, this dog or it’s progeny to any pet store, dealer, wholesale outlet, known puppy mills, guard dog business or research facility. If the Buyer is unable or unwilling to keep the dog or provide an appropriate home in accordance with this agreement due to any reason, including the death of the Buyer, the dog will be offered to the Breeder first – in writing. Buyer agrees he/she will not dump, give away, abandon the dog to a shelter, rescue, or any place else, but shall contact the Breeder to assist in acting as agent to re-home the dog in an approved environment. Upon the event the dog is returned, the Breeder is under no obligation to refund any part of the purchase price. Registration papers (if applicable) will be supplied and signed over to the Breeder upon surrender of the animal, as well as all medical, trial, and show (if applicable) records. The dog must be up to date on all vaccinations and must have had a negative heartworm test within ten (10) days of return. Agreed to this _________ day of __________________, 20______. *Since I use PayPal to accept payments when you pay for the puppy you are agreeing to this contract. *Please keep us updated on your puppy I would love to see them all grown up.